This album is a two-CD set. 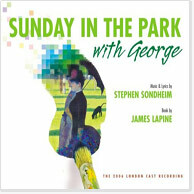 Stephen Sondheim & James Lapine's Pulitzer Prize-winning musical, in its most complete recording. This new album features the 2006 London cast, headed by Olivier Award-winner Daniel Evans and 2006 Olivier Award-nominee Jenna Russell, both of them Tony-nominated when the show transferred to Broadway in the spring of 2008. Audience and critics have been unanimous in their praise of this production, which recreates the world of Seurat's masterpiece Sunday Afternoon on the Island of La Grande Jatte with the use of groundbreaking projection and animation technology. Now this legendary score and acclaimed production, directed by Sam Buntrock, have been preserved in a comprehensive two-disc set. Click here for the lyrics to the bonus track: The One on the Left (complete version). "They are out early today."